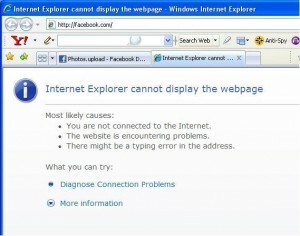 Facebook addicts enthusiasts were sure to have noticed the outage last night – or early morning, rather. The downtime lasted for about two and a half hours – the longest in four years. While some people (like yours truly) just gave up and forgot about the social networking site for a while, others just got totally frustrated. He goes on to say that the system resulted in a feedback loop that bogged down the database. In short, users couldn’t access the site. Interestingly, the only way they could fix the situation was to shut down the site. Think about it this way…if your computer freezes and will not respond no matter what you do, what is your course of action? The chances are that you will simply turn the device off and then have it up and running again in a few minutes. That’s basically what the tech guys at Facebook did. Of course, the downtime took much longer than rebooting your computer, but that is only understandable considering the larger scale of the operations of the social network. In any case, they had the site up in a couple of hours and we’re all enjoying the new Facebook look. Don’t be surprised, though, if you encounter a few problems here and there in the next few days. They’re still looking at the issue and doing a few tweaks. What matters now is that you can go check your food in Cafe World and make sure they don’t spoil.